Today you have a very important task. Guess what! Yeah! You must help the dad of Gumball not to wear pants! Just climb up and run away from the parents. It is so funny! Collect coins and avoid any pant! Use the left and right arrow to control. We wish you good luck! We are looking for the person, who can help this cute guy, cause he does not want to wear pants! 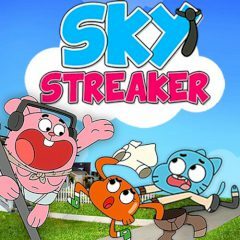 Gumball’s dad is determined to set the new world record for not wearing pants! Here you must avoid clothes and grab coins as you climb skyward. So be careful! Gumball and Darwin are hot on your heels. And remember, no pants! No way! So, if you are ready then use the arrow keys and move up. Avoid pants and collect as many coins as possible! Everything depends on you now, just have faith in yourself and help this cute guy.